If you are a parent, I have something to share with you. Being a grandparent of 6 and recently having some serious quantity and quality time with one of them – daddy has been deployed – I am reminded that little children have a will of their own. Of course it’s natural. Humans, including little toddlers, are given a will to live, learn, and try new things. It’s actually a good thing that is only a problem if the adults around the child are not up to the task of leading. The will of the child must not have free rein. The child will bounce from this to that, touching toys and things that aren’t toys; they are walking, running, reaching to both good and bad things. Again, this is all very natural and speaks to the vitality in a child. But the child doesn’t have the sense to know right and wrong. The child doesn’t have self-control. This is why God designed the child to be created by two adults. God wants adults supervising children. God wants adults surrounding the children to guide, train, and discipline them. If you are a parent that hesitates to say “no” to your child, and in creative ways showing right and wrong, then you are simply unfit and not up to the task. Harsh words? I know. The words of Christ are pertinent where He warned against being a stumbling block to the little ones. Do not hinder them from coming to Christ. 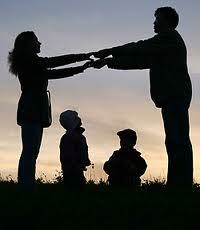 A parent that wont’ guide and discipline his child, will be at fault when the grown child goes astray.